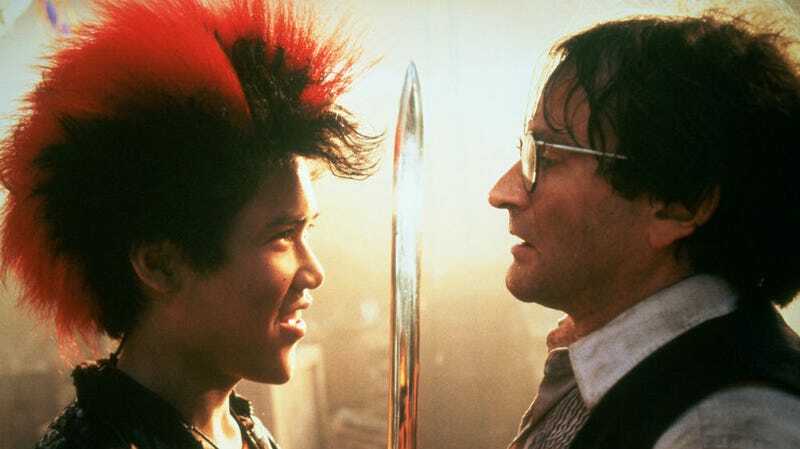 Dante Basco, as Rufio, shows down with Robin Williams’ Peter in Steven Spielberg’s Hook. It was, quite honestly, a perfect moment. A moment that spoke to a simple truth: To a certain generation, no one is better than Rufio, Basco’s character from Steven Spielberg’s 1991 Peter Pan reimagining, Hook. Rufio was a leader, a badass, and the one kid feared by Captain Hook. He didn’t just have one mohawk, he had three. He was the coolest and to this day, he’s a fan favorite character in pop culture. So when I was contacted about interviewing Basco in the leadup to Hook releasing on 4K HD this week, I replied quickly and eagerly. To get the chance to talk to an actor who was such a huge part of your childhood was too good to pass up and, afterward, I realized the interview was too good to cut any of it out. We talked to Basco about how he got the role, the food fight, the amazing costume, Rufio’s legacy and so much more. The Hook 4K Blu-ray, which is out now. io9: Take me back to the beginning What do you remember about getting the role? Dante Basco: The audition process is always, you go to auditions and you go to callbacks. The crazy thing about Hook was it was one of the movies in town that everybody knew about. It was the biggest film shooting in Hollywood at the time and the idea of Robin Williams playing Peter Pan really captured everybody’s imagination. I remember calling my manager and saying “I just want to audition for any of these roles.” My little brother auditioned for one of the Lost Boys and I was like, “I want to get in on it.” And then I got an audition. I actually went to the audition with my other brother. My little brother had auditioned for one of the roles, Dion, and then my other brother, Darion, we both auditioned for this Rufio character. So I’m getting coaching on it and kind of dressing up and going in for the audition with the casting director, Janet Hirshenson, and it went great and a few days later they were like “Steven Spielberg wants to meet you.” I was like “Wow, that’s cool.” So I remember going to Amblin which is where Steven Spielberg’s office is on the backlot of Universal Studios. I don’t know if you know the studios but most of it is grey soundstages and what not. But there’s a little section in the back of it that’s Amblin, which is like this Spanish Villa on the back lot of Universal. It has its own security and all that kind of stuff and I later found out, when I went to Steven’s house for rehearsals, it’s designed like his house. Dante Basco now, without all the mohawks. io9: That is amazing. So what did you bring to the character that wasn’t already in the script? How much of it is you? Basco: I mean he was there. [But] I was a serious young actor and I was working with legends in the industry. So I would go home every night and watch Hoffman films, watch Pacino films and maybe I brought an aspect of that. Plus, he said I scared him. I grew up in a pretty rough neighborhood, Paramount, California, outside of L.A., like near Compton, that’s where I’m from. What I was bringing to the character, especially at that time in my life, I grew up in a gang neighborhood. Gangsters were around, drugs and everything. It was a tough time to grow up. It was cool, but it was a tougher neighborhood. And to a degree, the Lost Boys are a little gang. So I think I had a bit of that coming into it. But on top of that, when you’re chasing giants, I’m studying a lot at the time, my acting coach is going over scenes and again I’m watching these films. Later in life, running into Dustin at different premieres and whatnot he’d introduce me to some other actors and he’d say “This kid is chasing us.” That’s what you’re bringing as a young actor, especially working with your idols. Now looking back it’s so weird. You’re a foil. You’re another kind of leader. There’s Robin Williams, there’s Dustin Hoffman, then there’s you as this other force that’s supposed to be standing up to these guys, not as the equal but as the new star. So that’s part of what I brought to it. It really was a young hungry actor kid from the neighborhood just trying to do a good job and to be a great actor. Robin Williams in the iconic food fight scene. io9: I have to ask about the food fight scene. Any time anyone talks about Hook, they talk about the food fight scene. What was that like, what do you remember about it? Dante: We actually shot that food fight twice, which is crazy. But, the funny thing about the food fight, for me, is if you remember it’s a scene where Peter Pan and I are fighting. A lot of times when you remember back to certain scenes you remember your state of mind or how you were feeling that day. And it’s one of peoples’ favorite scenes in the movie. It’s so fun, it’s so entertaining but for Rufio it’s a bad day. It’s like the end of his reign. So I always remember it like everyone else was having a good time but I was not having a good time that day. But the great feeling of us going back and forth and the banter with Robin Williams and really seeing the magic of Robin doing the lines then being able to improv and sitting there trying to improv with Robin Williams is pretty crazy. Then we get to do what every kid wants to do which is have a food fight. At that time they had like a whole thing of food, not just the crazy stuff we were throwing at each other, but there were all kinds of different foods out there. Then they started making all this frosting stuff in different colors that we were throwing at each other. Nowadays you can go to the supermarket and probably get like turquoise blue and pink and all that kind of stuff but back in those days you couldn’t go to the store and buy that. They were making that stuff on the set right in the moment. Everyone had a fun time doing the food fight and I always remember afterward everyone washing up, groups of Lost Boys, we were just a mess. There was only a certain amount of wardrobe that we could do before they’ve got to wash everything. It was just boys being boys. It was fun. Rufio welcomes Peter Pan back to the Lost Boys. io9: Did you do one take, wash up, and then do a second take or did you do the second take on another day? Basco: We did small takes then we did one take where everyone could kind of go crazy. And we went back and shot another day because it wasn’t easy to clean up that stuff especially off the costumes. One take and it’s done. You’re over. That’s it. io9: Speaking of the costume and the hair, that’s part of what made Rufio so iconic. Was that always the concept? Did you have any input? Tell me about the look of the character. Basco: He was the newest Lost Boy. The most modern Lost Boy and he wasn’t in the J.M. Barrie books. He was a new character created for this film and there was a lot of sketching going on. Sketches of Rufio with like dreadlocks, there were different looks going on. And then they just started trying things and that’s when the look began, which now is great. But I always tell people when I go to Comic Cons, there are people dressed up as Rufio at all the Comic Cons, it’s this really cool look, but when you’re 15 years old and you just want to be cool, you know? It kind of took me back a little bit. The Lost Boys with their leader, Rufio. io9: Though it was embarrassing then, it seems like you still really embrace the character. You’ve reprised the role online and stuff and sometimes actors hate looking back and talking about their childhood roles. What makes you so okay and cool about this one? Basco: I mean, I’ve never not liked it, but you move on in your career. You grow up. But after 25 years it’s fun to have characters on your resume and your past that people still love. I think social media changed a lot of things. Rufio’s a classic character and I did Zuko (from Avatar: The Last Airbender) for Nickelodeon that became really popular within the whole comic con world. I think it’s one of those things that, as you grow up, you’re able to appreciate aspects of your career and celebrate them with fans out there and understand and engage on social media. Like it’s nostalgic for me too so it’s kind of fun to capsulize a part of your life which, to me, was 15. Clearly, it means a lot to so many people and it’s something I’m proud of too, work-wise. Look, everyone who ever comes to Hollywood, you hope to do something that people will remember you for. We work on so many things and I continue to work today, not just as an actor but as a writer and a producer. But [certain roles] really kind of mean things to people. [Hook] has become, for a certain generation, a part of the vernacular. The way they talk to each other. How they think of it, who they are. It’s weird. I’m constantly blown away. And, again, with social media, you’re able to experience it in a different way with people. Like people sent me tattoos of Rufio on their bodies. As far as like “Bangarang” coming out by Skrillex, and talking to him about the whole thing and just meeting other artists that were influenced by it and impacted by it. It meant so much to a generation of people. Also, being a person of color, that character Rufio, as a person of color in a leadership role in a major film, for a lot of the Asian American community, that was the first cool Asian American character they’d seen in their lifetime. And that impacted even a movie today. Jon Chu, [director of] Crazy Rich Asians, he’s become a good friend. And talking about representation in film and him going “That was the first time I felt represented” and how he felt he could be a part of Hollywood because of that character. Those are the kinds of things that you don’t even know until later on in life, the impact you had. These roles we do in our career are like pebbles on the pond, we never know what ripples they make. No CGI here. This was a real pirate ship. io9: Man, I could talk to you forever, but I only have time for one more question. When was the last time you watched Hook and how did you feel it help up? Basco: I went on a tour for the 25th anniversary, which was about two years ago, with Jimmy Madio who played Don’t Ask, we always stayed friends throughout our careers. We went on a tour together with Alamo Drafthouse and we watched it together once with [executive producer] Jim V. Hart. And it was magical, man. It was the first time I’d seen it in like, over a decade or so and in a movie theater with a packed audience, sitting next to Jimmy and sitting next to Jim Hart and Jim telling me some stories, since I was a kid, telling me a bit about what’s going on on the adult side of the film, it was pretty magical. The further away from a project you get you can start appreciating it as a fan and not as being attached to it. In that way I really loved it. It really held up to me and it really represented...so much has changed in the world and so much has changed in our world of Hollywood, filmmaking, the connection to how we used to make movies. I mean we don’t make movies the same way anymore. No one is doing what Spielberg did. I try to explain to young filmmakers now, there is no CGI. You see that pirate ship? You walked in the room and there was a life-sized pirate ship in a big soundstage, in the water. It was crazy. It was just a magical way to do work. They just don’t make movies the same way right now. So kind of being connected to old Hollywood in that way is pretty magical. It’s weird. A lot of times as an actor you watch a film it’s like thumbing through a photo book from your past. It’s people you haven’t seen in a while, there are people that have passed away, and there are people you owe phone calls to. And again, like, it’s my teenage days. Who gets to look back at their teenage days in a crazy home video like Hook? If you’d like to see Basco’s crazy home videos from the age of 15, it was finally released in 4K this week. It’s called Hook.